Also figured I would do a group shot of what I have painted so far for the PP Forum’s Tale of 2014, seeing as we are half way through the year. It was actually a request from someone on the PP forums. As I was at a friend’s house using their nice gaming terrain I thought I would take a quick picture on my camera phone. 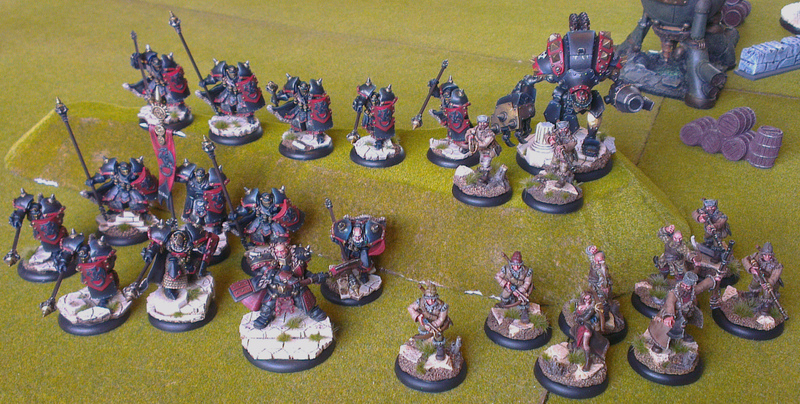 This entry was posted in Warmachine & Hordes, Work in progress and tagged Butcher1, challenge, club gaming, khador, paint the target, painting, painting work in progress, warmachine. Bookmark the permalink. Hah! I totally figured you were joking when you mentioned doing the chipping across the whole model. I think the extra battle damage adds some solid personality to the most infamous brute The Motherland has in her service. And the whole crew sure does look fantastic all together. Thanks jimb0, I admit it was actually suggested to me completely as a joke, but I thought why not.